Prior to his collaborations with a bevy of home country figureheads, not to mention his own outright solo endeavors, noted Kiwi Peter Jefferies made a caustic and occasionally tuneful noise with his brother Graeme in the Nocturnal Projections, circa the early-80s. While Peter eventually went on to relative notoriety and acclaim, it was Graeme's jittery guitar leads that splattered the Projections canvas with vivid aplomb, particularly on the aggressively fervent "In Purgatory," "Moving Forward," and "Walk in a Straight Line," all of which practically scream "post-punk" from every pore. Brilliance. Elsewhere, faint proto-goth gestures ooze their way into NP's sonic slipstream, suggesting that the brothers Jefferies may have been early adopters of Bauhaus and Echo and the Bunnymen. In their lifespan, the New Zealand quartet released merely a handful of eps. 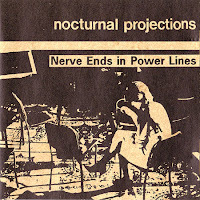 Nerve Ends in Power Lines compiles various fragments of all of them, padding on unreleased material to boot. As an extra special bonus, there are no less than four hidden tracks, culled from "self-released cassettes," per The Doledrums blog, who have been thoughtful enough to supply us the titles of which. This rip was taken from my own CD copy, which from what I understand is just about as scarce as the original Nocturnal Projections 12" eps. I've separated all the hidden tracks for your convenience. 09. Could it Be Increased? Orange skies will pick you up. Progress report: All 2009-2013 links fixed. I’m the cause and you’re the blame.